You'll Be Proud To Share...? Facts About Maine was, so far, just about the most fun I've had writing a page for this website! State Vessel: The Arctic exploration schooner "Bowdoin"
Maine is the first state in the U.S. to see the dawning of each new day. 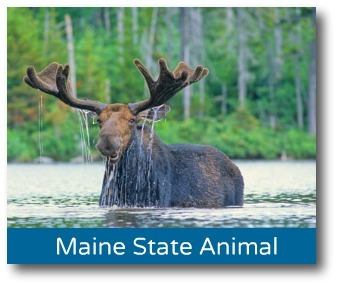 Maine is the only one-syllable state in America. Maine is the only continental U.S. state to share a border with only one other state (New Hampshire). Maine's Senator Margaret Chase Smith (R) served the Senate (to date) longer than any woman has (24 years); was the first woman ever elected to both the U.S. House and Senate: was the first woman to hold a Senate Leadership position; and won the 1960 race for Senate in the nation's first ever race pitting two women against each other for a Senate seat. Maine was part of Massachusetts until statehood in 1820. Maine has America's first chartered city (York - 1641). Maine's Constitution was written in part by Thomas Jefferson. Maine is the northern end of the famed Appalachian Trail. Maine accounts for approximately 90% of the U.S. lobster harvest. Maine has the largest wild blueberry crop in the nation, raising 99 percent of all wild blueberries in the United States and is the single largest producer of any blueberries (wild or cultivated) in America. Maine is about as big as all of the other five New England states combined. Maine is the most sparsely populated state east of the Mississippi. Maine has the largest fleet of windjammers in North America. Maine has over 60 lighthouses. Maine produces 90% of the country's toothpick supply. Maine has the only natural fjord on the East Coast of the United States (Somes Sound). Acadia National Park is the only national park in New England and the first on the East Coast. Facts about Maine - The Musical! I like to imagine that the two fellas in this video are the two men on the Maine state flag come to life. The part of this video where our heroes are sitting by a harbor quizzing each other on facts about Maine is none other than beautiful Perkins Cove in Ogunquit, 10 minutes from York.